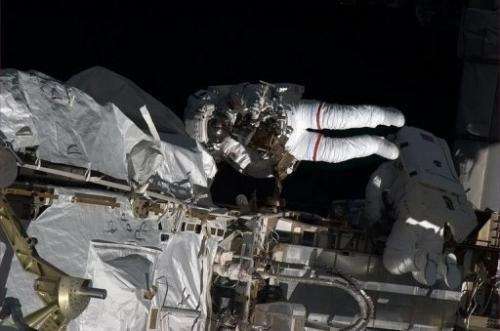 A May 11, 2013 NASA image captured by Canadian astronaut Chris Hadfield on board the International Space Staion shows astronauts Tom Marshburn and Chris Cassidy during a spacewalk to make repairs. The US space agency announced the appointment of eight new astronauts on Monday, and a record half of NASA's first astronaut class since 2009 are women. The US space agency announced the appointment of eight new astronauts on Monday, and a record half of NASA's first astronaut class since 2009 are women. The astronauts will earn between $64,000 and $141,000 per year, and will be part of the team that lays the groundwork for NASA missions to an asteroid in the 2020s and to Mars in the 2030s, NASA administrator Charles Bolden said. "This new class will be among those who have the opportunity to plan and carry out these exciting missions," said Bolden in a video message on the NASA website. The eight were chosen from the second largest pool of applications ever received—over 6,100—NASA said. Among them are Nicole Aunapu Mann, 35, a Marine Corps major and F/A 18 pilot; and Anne McClain, 34, a major in the US Army and OH-58 helicopter pilot. The others are Jessica Meir, 35, an assistant professor of anesthesia at Harvard Medical School and Christina Hammock, 34, who is National Oceanographic and Atmospheric Administration (NOAA) Station Chief in American Samoa. The male astronaut candidates are former naval aviator Josh Cassada, 39; Navy lieutenant commander and F/A 18 pilot Victor Glover, 37; Tyler Hague, 37, a US Air Force colonel working to tackle improvised explosive devices; and Andrew Morgan, 37, an army major and physician of emergency medicine. The last class announced in 2009 included three women. The group of astronauts named in 1998 also included four women, but out of a larger hired group of 25.